For this discipline, only team leaders can register the countries team. 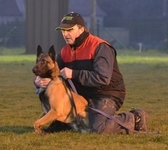 Before making the team leader request, make sure you have a working dog account (free). Login with your account, make a team leader request. The administration will validate the request and then you can register the team. Please take your time to do this and check all details twice!! If questions about registration, contact us please. A copy of the pedigree is mandatory. Please, also respect the rules at all times, very important! Mondioring team is composed with maximum 8 effective participants and 2 reserve participants. Payment for the registered effective participants is mandatory. Read regulations for the compositions concerning the different classes.